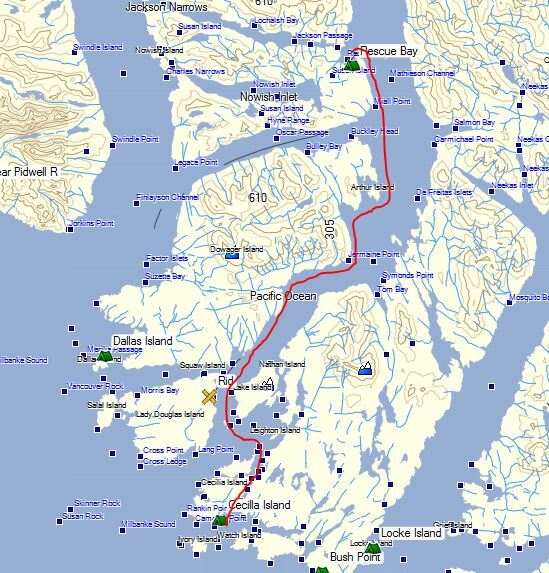 Paddling the southern end of Mathieson Channel was like kayaking across some huge northern lake. The water was mirror smooth. So much so, it was sometimes vertigo-inducing. 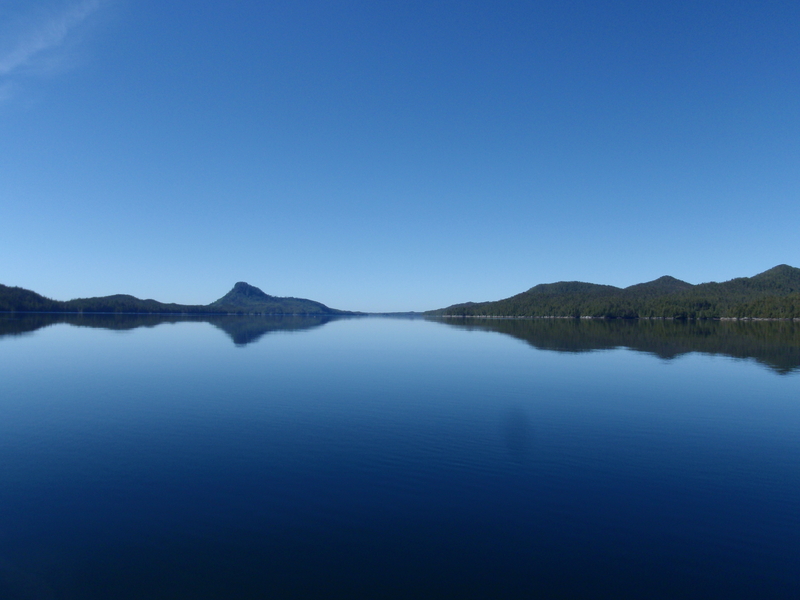 As I looked at the rock walls on my right, the border between real and reflection was seamless. 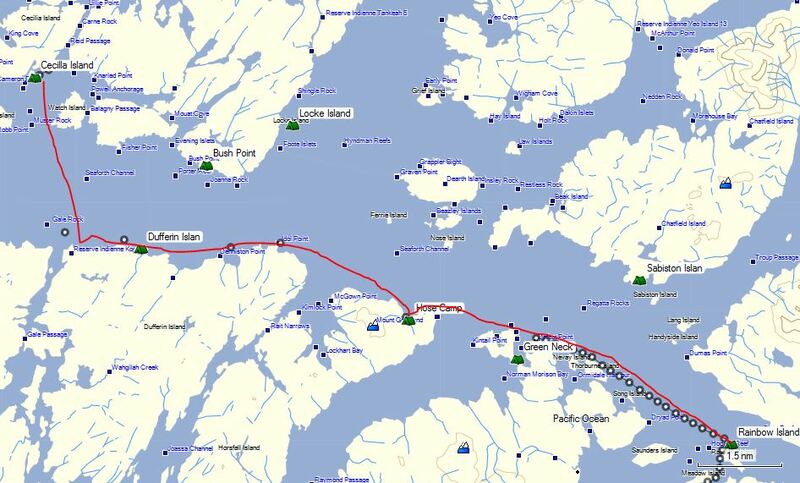 My plan, formulated the previous night, had been to camp at Cockle Bay, where I knew there was a First Nations cabin. According to my Wild Coast guide, non-natives were welcome to camp on the beach. But despite hearing a boom box playing from the cabin, and hailing several times as I bobbed offshore, no person appeared. This fellow did though. Sure, he put on his best Benji for the camera, but trust me, he went completely Cujo every time I made a move towards landing. Taking the hint, I paddled on. 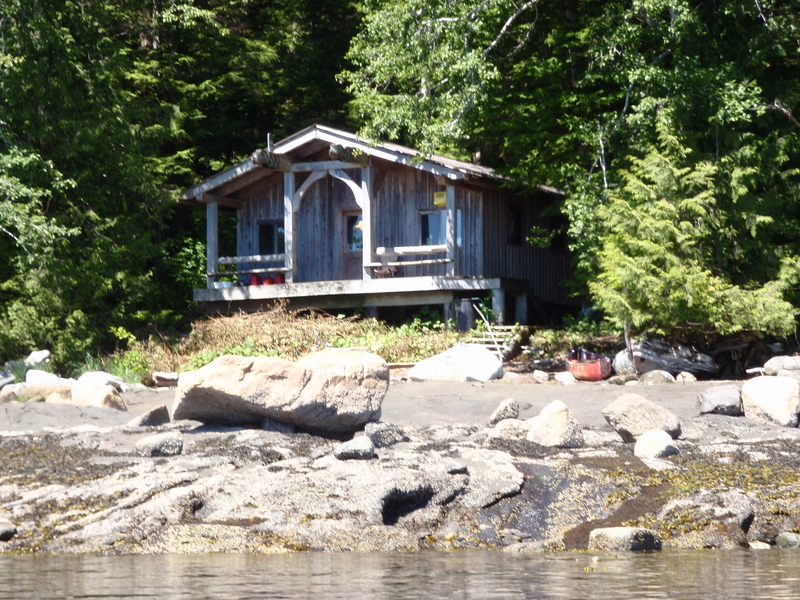 On the islets at the south end of Cockle Bay, I came across a guided group tour from Kingfisher Adventures. This was rather cool, since I knew Andrew (the owner) from back in the day on the paddlewise web group, but hadn’t met him in person before. I lunched with them, then we all ran Perceval Narrows together. 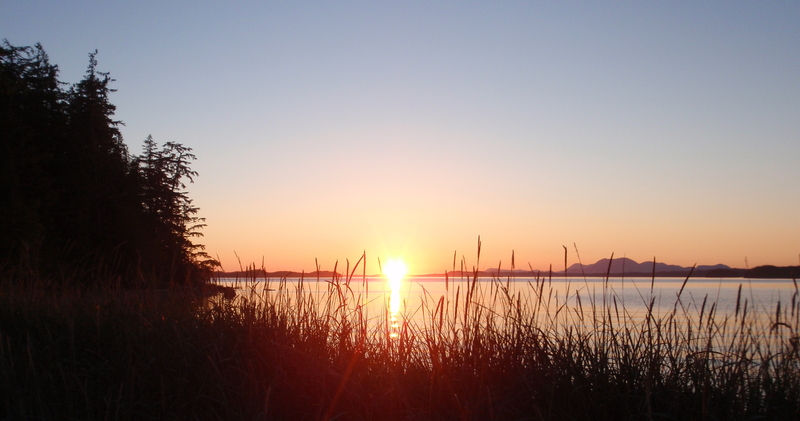 Just beyond, they spotted a possible camping beach on Cecilla Island’s northwest corner. Don, the assistant guide, said they’d probably camp there. 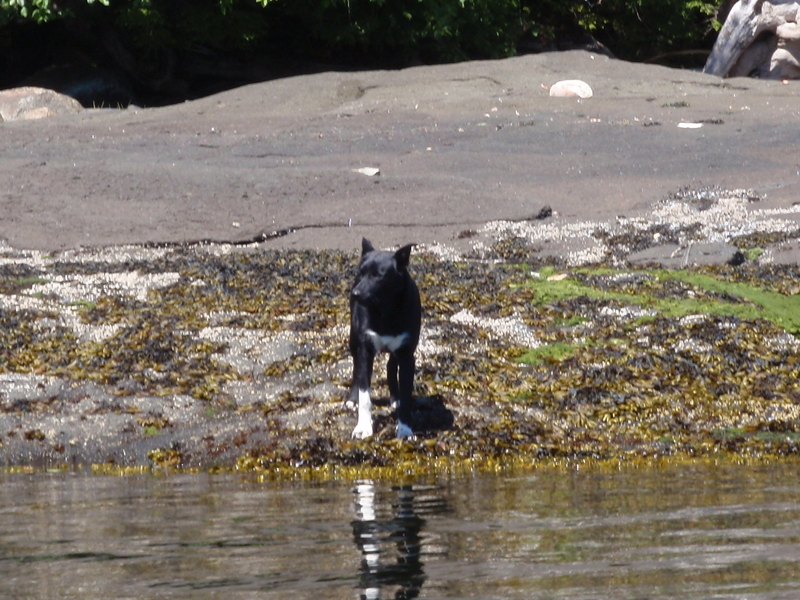 I carried on, and landed, pretty bushed, on a flyspeck islet at the south end of Cecilla. A Pod Of Kayakers or A Clique Of Kingfishers? As was my wont after a day spent in the wetsuit, I wore nothing but my sandals, sunglasses and hat while I made my portage runs up and down the beach. On about the third shuttle, I glanced up from beside my beached boat to see the Kingfisher tour group bearing down on me. I quickly slithered into the only bottoms to hand – my rain pants – and stood there to greet them. Since this was one of the few large tent sites in the area, I’d half anticipated they might show up. So I’d already scouted a place for my hammock that wouldn’t take up a tent site, and assured Don there was room for all. They allowed as to how that was alright, and back-paddled, trying to avoid eye-contact. Apparently sharing a small island with a perve who worn sauna pants in the summer heat didn’t appeal. Especially since this one was clearly going commando. Their loss was my gain, as I enjoyed a superb site all to my own. Perhaps I’ll pack black leather chaps and a matching captain’s hat for future trips where there’s competition for campsites. Splendid stars during the night. The day dawned so warm and sunny, I opted not to wear the wetsuit – just as well, as I’m sure I would have been incapacitated by heat in the afternoon. I pulled into the campsite at Hose Point to scout it out for future reference, but swarms of flies drove me off before I could even fill my water bags. On the plus side, the wind speed fluctuated, but never slowed to the point where I could not get at least a boost with one or both sails up. This was especially welcome as my right wrist was a bit throbby after many long days of upwind paddling. 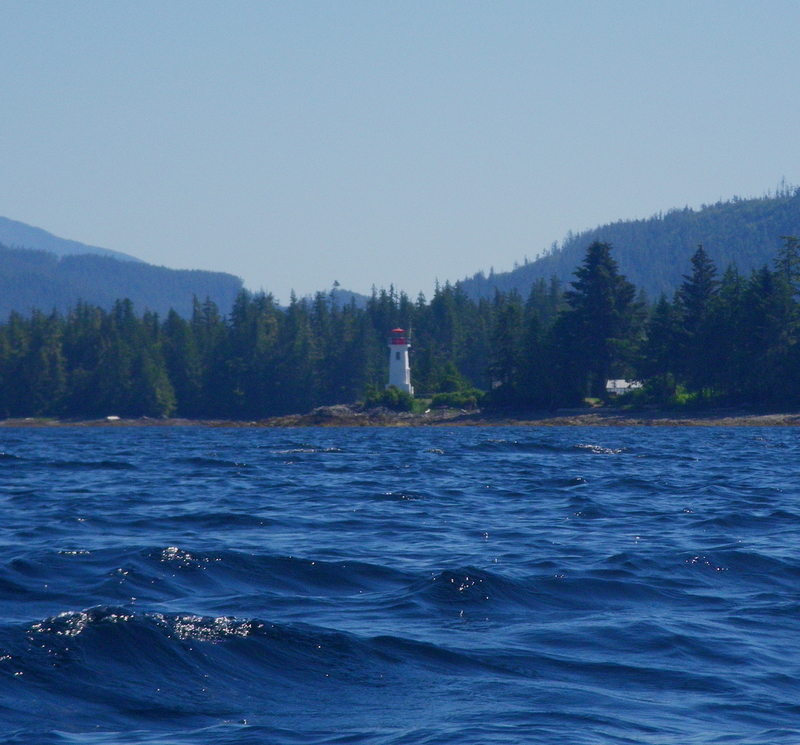 Completing my content, the sun shone, the water sparkled, and the wave-tolled bell on the buoy near Dryad Point Lighthouse lent a jauntily nautical air to my journey. Just after 16:00 hours, I landed on Rainbow Island. Despite its magical name, there were no unicorns to be seen, but there was something just as welcome: After a brief moment of annoyance as I contemplated the sloped, cobbled shore that promised all the comfort of bedding down on a bag of baseballs, I discovered that the tall reeds and natural berm at the top of the beach concealed a miniature meadow, flat, grassy and protected from the highest tides. Alarms and excursions during the night. Hearing an animal bumping and thumping against my kayak, I trepidatiously investigated by headlamp, half-fearing it would be a racoon or worse yet, a skunk. It proved to be an otter – one of a whole raft of them, each of which proceeded to scamper hither and yon, ricocheting off my boat and one another, all the while snarling and hissing contradictory commands about which way to make their collective escape. The sun woke me at 8AM by turning up the heat in the tent. I happily rigged the tarp again – this time as a sun shade rather than a rain roof, and proceeded to dry all my possessions, and to shave for the first time in twelve days. The breeze was just strong enough to keep things from being too warm or too buggy. I spent the rest of the day in delicious sloth, finishing off the book I’d been reading during my trip (The Ancestor’s Tale, by Richard Dawkins). Up at 6:30AM, painlessly after yesterday’s rest, and in any case, sleeping in by comparison with my typical 5AM starts on the outer coast. 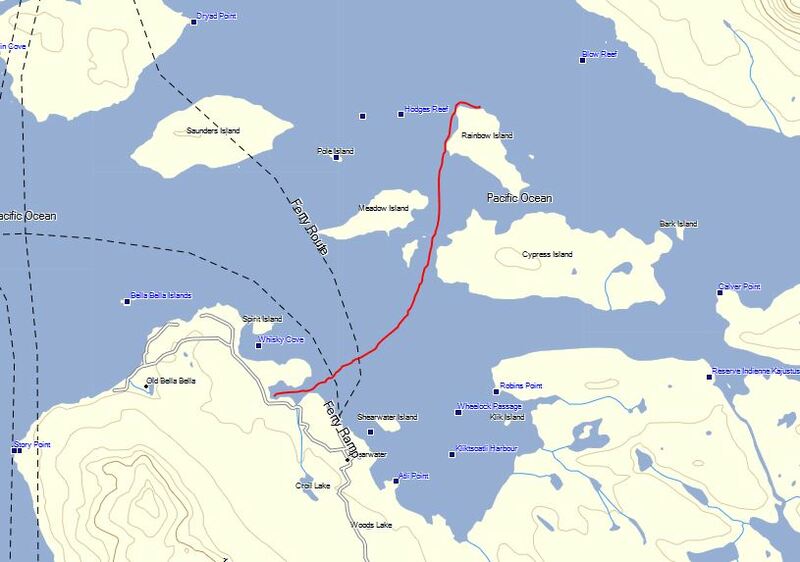 I paddled through cool, clouded-over calm the couple of nautical miles to my take-out at Shearwater, where I would catch the ferry back to Port Hardy. 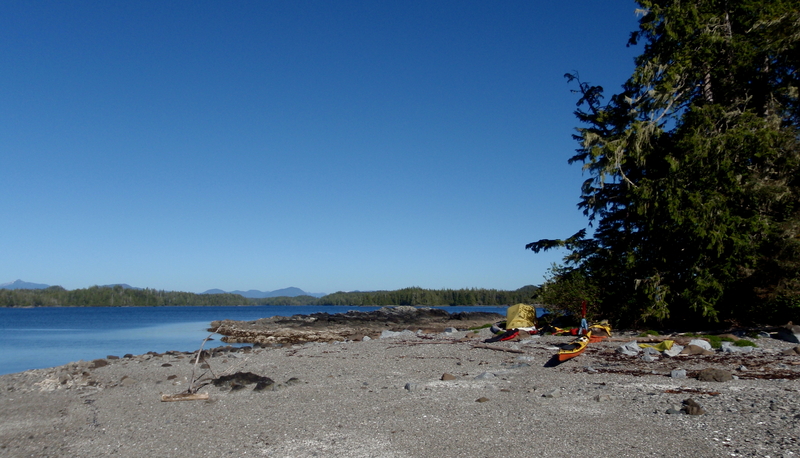 Just off Shearwater, I waved to a couple of campers emerging from their tents on an islet. I made my phone calls to let the world know I was safely landed, then headed to the marine pub for lunch. 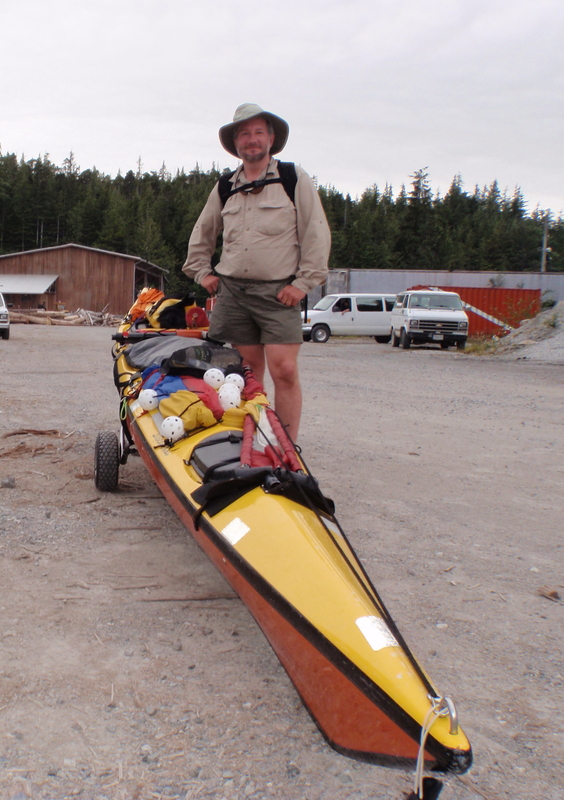 There I bumped into the islet campers, who proved to be John Lockwood of Pygmy Kayaks fame, and his daughter Freya. We wound up dining together and John proved to be a fascinating conversationalist, with lots of stories about the early days of sea kayak expeditioneering on the west coast and elsewhere. As I took my first pull on my first beer in weeks, I realized it was still only 11AM. Ah well, surely the sun was over the yardarm somewhere in the world. The first chapter of this story is here. 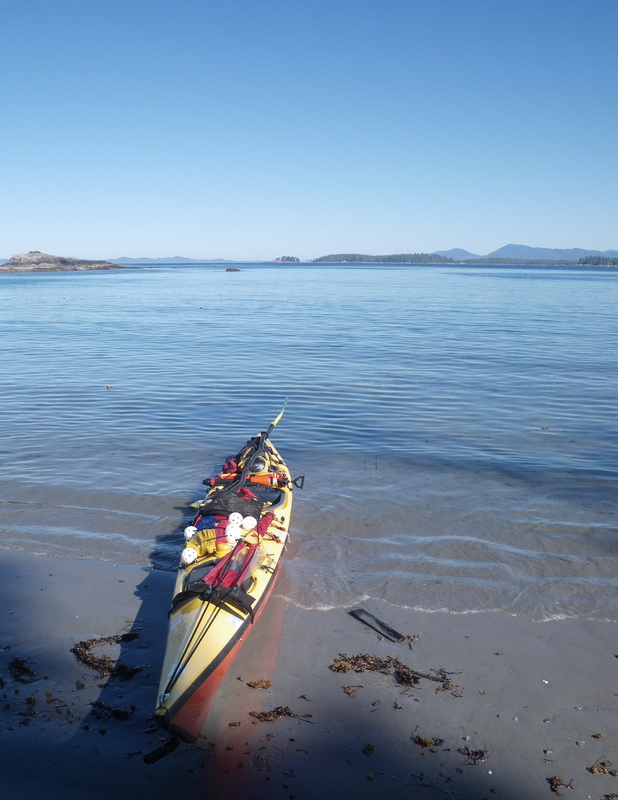 This entry was posted in Camping, expedition kayaking, kayak camping, kayak sail, Kayak Sailing, kayak touring, sea kayak, sea kayak sailing, Sea Kayaking, Tents and tagged BC, Bella Bella, British Columbia, Camping, Great Bear Rainforest, kayak camping, Kayaking, outdoors, Pacific Northwest, Shearwater by Philip Torrens. Bookmark the permalink.